Igusa class polynomials are the genus 2 analogue of Hilbert class polynomials; their roots are invariants of genus 2 curves that have complex multiplication by a fixed order. 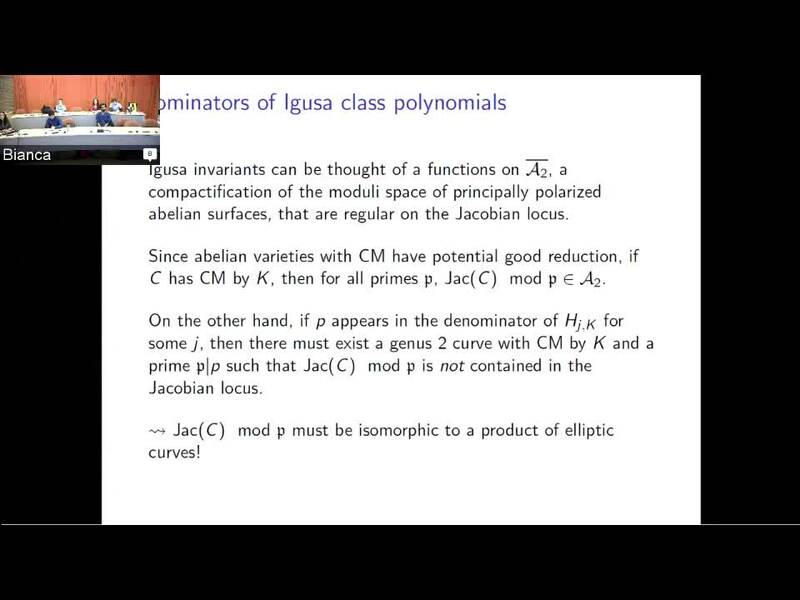 The coefficients of Igusa class polynomials are rational, but, unlike in genus 1, are not integral. An exact formula, or tight upper bound, for these denominators is needed to compute Igusa class polynomials and has applications to cryptography. In this talk, we explain how to obtain a formula for the arithmetic intersection number G1.CM(K) and how this results in a bound for denominators of Igusa class polynomials. We also explain how the formula for G1.CM(K) leads us to a generalization of Gross and Zagier's formula for differences of CM j-invariants. This is joint work with Kristin Lauter.